The Nobel prizewinning chemist, Sir William Ramsay made his most celebrated findings in inorganic chemistry, discovering the inert gases, argon, helium, neon, krypton, and xenon. Led to the conclusion by different paths and, at first, without working together, both Lord Rayleigh and Ramsay succeeded in proving that there must exist a previously unknown gas in the atmosphere. They subsequently worked in their separate laboratories on this problem but communicated the results of their labours almost daily. 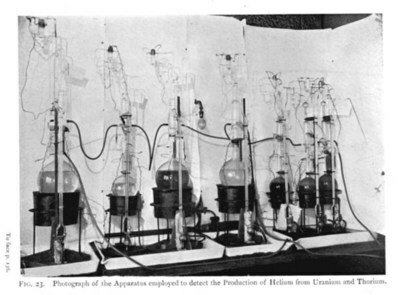 At the meeting of the British Association in August 1894, they announced the discovery of argon. "In September, 1898, the discovery of another gas was announced; it was separated from krypton by fractionation, and possessed a still higher boiling point. We named it 'xenon' or the 'stranger'". While seeking sources of argon in the mineral kingdom, Ramsay discovered helium in 1895. Then guided by theoretical considerations founded on Mendeleev's periodic system, he methodically sought the missing links in the new group of elements and in 1898 found neon, krypton, and xenon. Ramsay, with Frederick Soddy also detected helium in the emanations of radium in 1903. Ramsay received the Nobel Prize in Chemistry in 1904, "in recognition of his services in the discovery of the inert gaseous elements in air", along with Lord Rayleigh who received the Nobel Prize in Physics in the same year for the discovery of argon. The Ramsay Chair in Chemistry is named for Sir William Ramsay (1852-1916), who studied and taught at the University. He won the Nobel Prize for Chemistry in 1904 "in recognition of his services in the discovery of the inert gaseous elements in air, and his determination of their place in the periodic system". Born in Glasgow, Ramsay studied at the University, 1866 to 1870, working from 1869 at the city analyst's laboratory to gain practical experience in Chemistry. He studied in Germany from 1870 to 1872, receiving a PhD from the University of Tübingen. In 1874 he was appointed tutorial assistant in the University's Chemistry Department, where he carried out important research in Organic Chemistry. He was appointed Professor of Chemistry at University College, Bristol, in 1880. Ramsay's greatest achievements were in inorganic chemistry. His work with the physicist Lord Raleigh resulted in the discovery of argon in 1894 and he and his student assistant proceded to find helium, neon, krypton, and xenon, confirming a new group of elements in the periodic table. Ramsay received the Nobel Prize in recognition of the achievement. He went on to work with Frederick Soddy investigating radioactivity, and they provided experimental evidence for Rutherford's theory of radioactive disintegration. During his lifetime, Ramsay won a host of awards and honorary degrees in Britain and abroad. He was created KCB in 1902. 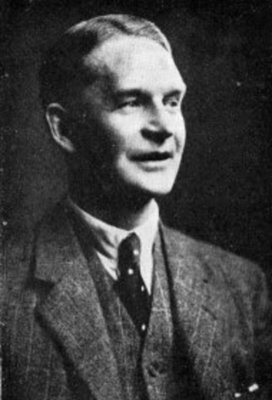 Frederick Soddy (1877-1956) was a chemist who lectured at the University of Glasgow before the First World War, and won the Nobel Prize in Chemistry in 1921. Born in Eastbourne on 2 September 1877, he was the youngest son of Benjamin and Hannah Soddy. He was educated at private schools and then attended Eastbourne College (1892-94), University College of Wales, Aberystwyth (1894-1895) and the University of Oxford, where he gained Postmastership at Merton College and graduated with first class honours in 1898. 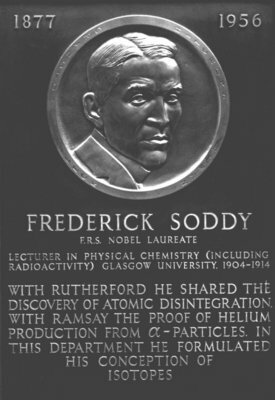 Soddy worked as a research assistant at Oxford until 1900, when he then spent two years at McGill University in Canada, lecturing in Chemistry and working with Sir Ernest Rutherford on radioactivity, and then with Sir William Ramsay at University College, London. He moved to Glasgow in 1904 as a lecturer in Physical Chemistry and Radioactivity, and it was during his ten years at the University that he completed his most important research into the chemistry of radioactive elements. 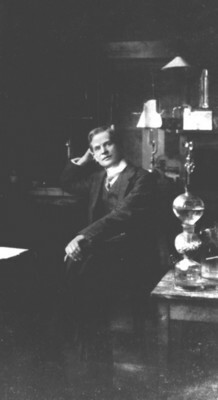 Working with collaborators including the laboratory assistant Alexander Fleck (who later rose to become Chairman of ICI), Soddy developed the "Displacement Law" - that, "when an alpha or beta ray is emitted, the element moves to a different place in the periodic table." In 1913 he formulated the concept of "radio elements chemically non-separable" which, at the suggestion of Dr Margaret Todd, a fellow guest at a dinner party in his father-in-law's house at 11 University Gardens, he named "isotopes". 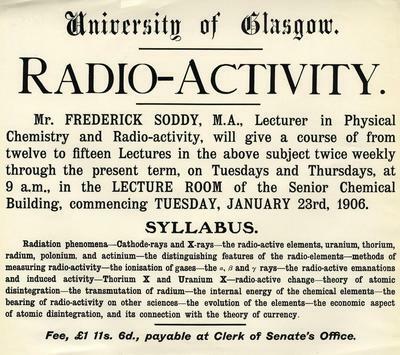 Soddy left the University in 1914 to the Chair of Chemistry at the University of Aberdeen, and in 1919 became Dr Lee’s Professor of Physical and Inorganic Chemistry at the University of Oxford, a post that he held until his retirement in 1936. During his career he achieved a number of honours. In 1910 he was elected Fellow of the Royal Society, and as mentioned above in 1921 he was awarded the Nobel Prize in Chemistry for the discovery of isotopes. He was the first English-born Chemist to receive this honour. In 1923 he was awarded the Cannizzaro Prize in Rome, and in 1936 he was awarded an Honorary LLD by the University of Aberdeen, and was also made a Foreign Member of the Swedish, Italian and Russian Academies of Science. Soddy died in Brighton on 22 September 1956, aged 79. By his will, he established the Frederick Soddy Trust to provide grants to "groups studying the whole life of a community." 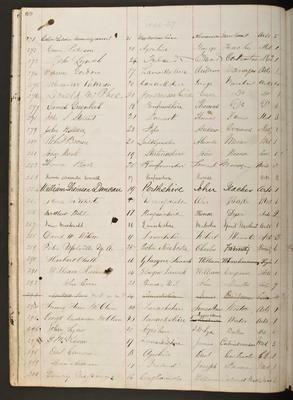 Sir William Ramsay's nobel prize biography page. 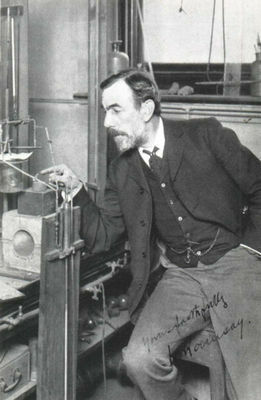 Sir William Ramsay jointly discovered, with Lord Rayleigh, the inert gas argon in 1898. The inert gas helium was discovered by Sir William Ramsay in 1898. The inert gases neon, krypton, and xenon were discovered by Nobel Prize winner, Sir William Ramsay in 1898. Sir William Ramsay was awarded the Nobel Prize for Chemistry in 1904 "in recognition of his services in the discovery of the inert gaseous elements in air, and his determination of their place in the periodic system." World Changing Project, "Discovery of the inert gaseous elements in air, and determination of their place in the periodic system," in University of Glasgow World Changing (University of Glasgow, 2010); http://www.worldchanging.glasgow.ac.uk/article/?id=64 (accessed April 23, 2019). World Changing Project. "Discovery of the inert gaseous elements in air, and determination of their place in the periodic system." In University of Glasgow World Changing. University of Glasgow, 2010. http://www.worldchanging.glasgow.ac.uk/article/?id=64 (accessed April 23, 2019). World Changing Project. "Discovery of the inert gaseous elements in air, and determination of their place in the periodic system." University of Glasgow World Changing. University of Glasgow, 2010. 23 April 2019 <http://www.worldchanging.glasgow.ac.uk/article/?id=64>.